I love cookbooks from the art press, Phaidon, of which the latter is one. They are beautifully designed, with full page spreads of food you would never cook, as they tend to honor the world’s most daring chefs. Such is the case with “Never Trust a Skinny Italian Chef.” The subject is Modena chef Massimo Bottura and his acclaimed restaurant, Osteria Francescana, which inevitably lands in the Top 5 of the world’s best restaurant lists, though never seems able to unseat previous #1 El Bulli and current #1 Noma (both subjects of multiple Phaidon titles). For me, these books tend to serve more as inspiration than anything else. Rather than attempt what Ferran Adria or René Redzepi have done, I look to them to push myself into my own new realms as an artist and chef. When I see Redzepi gathering local edible leaves and flowers, mushrooms and sea creatures, and crafting a gorgeous work of art on the blank canvas of a plate, it galvanizes my own imagination in the kitchen. The dish, “Bollito, not Boiled” (pictured above) for example was his reimagining of an Italian culinary tradition dating to the 13th century, bollito misto — “boiled meat”. Rather than boiling, each cut of meat was cooked separately sous vide to retain its essential character; traditional flavors were adjusted and retained — classic salsa verde appears as a green parsley foam, red peperonata as a gelatin. 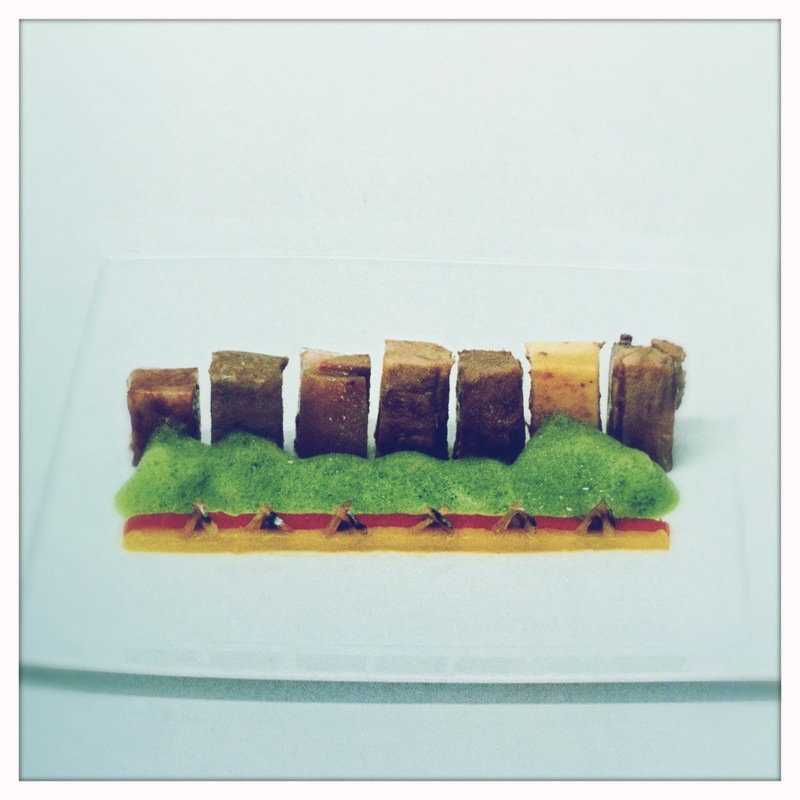 The plating was inspired by the New York skyline while Bottura was playing in Central Park with his son. Utter genius and creativity, no less so than Picasso exploding apart the human figure. 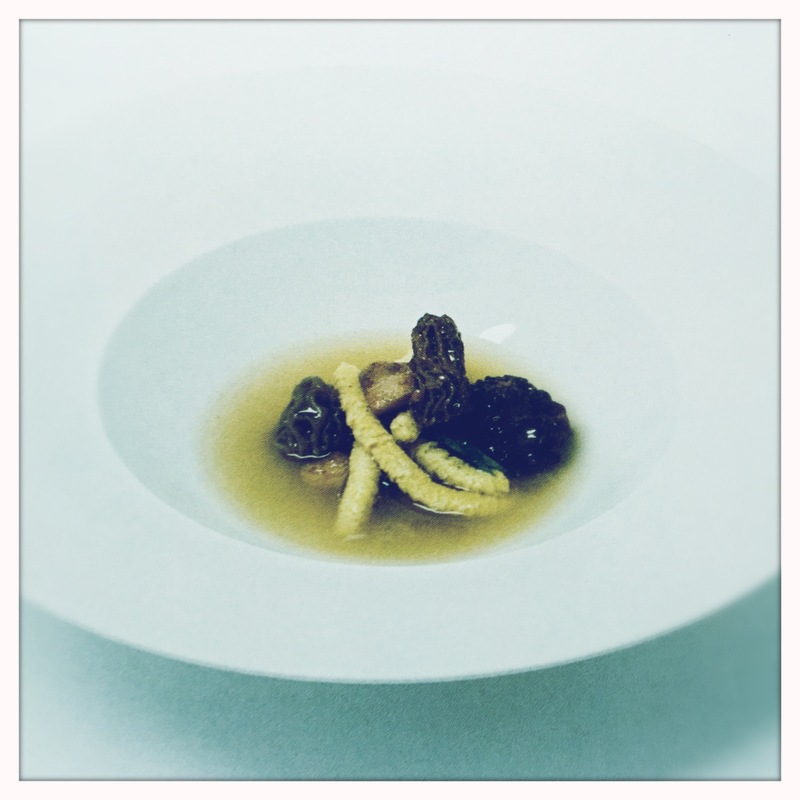 The dish that first caught my attention in the book was one called “Going Back.” It was inspired by Bottura’s youthful memories of bubbling cauldrons of pig head stock, digging up Jerusalem artichokes along a road, and making passatelli — a simple Northern Italian pasta and broth — with his mother. “Going Back” — his version of passatelli — swapped out the traditional bread-crumb pasta for one made of powdered truffle, celery root and Jerusalem artichoke; smoked morels evoked the scents of the hearth in his mother’s kitchen; his pig head stock included smoky mushroom water and crisp pork cheek. Something old, something completely new. My mother is not Italian. But I do have memories of cooking at her side as a kid, many of which involve the scents of warm broth and fire (not a hearth, but the occasional tortilla catching on fire). As intriguing as Bottura’s dish was, it was the original that I was curious about. 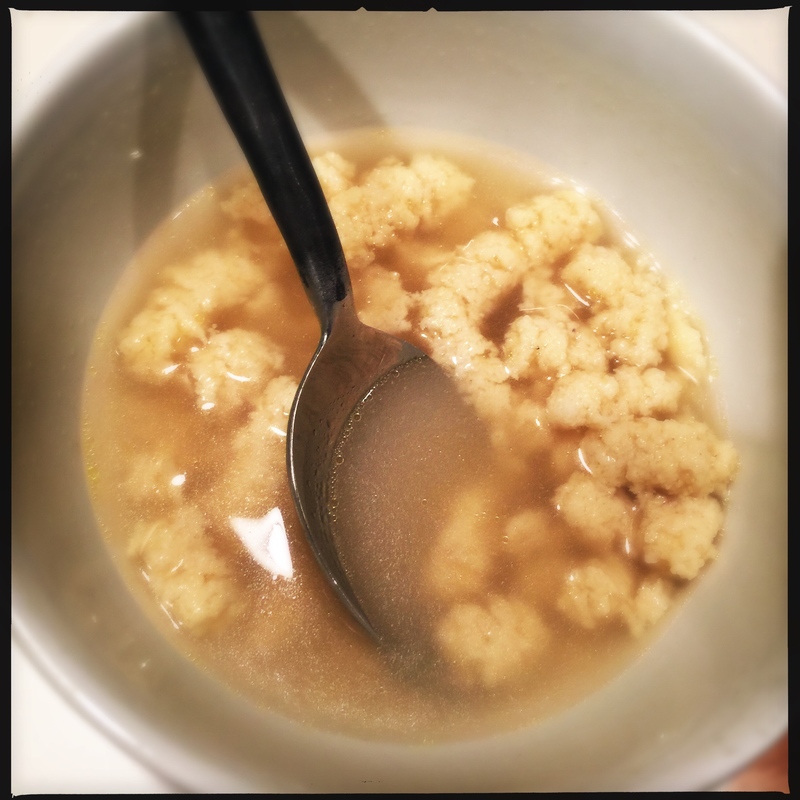 So I spent a little time online and in my more traditional Italian cookbooks to understand passatelli: a soft pasta made of bread crumbs, egg and parmesan, pressed through a ricer into hot chicken stock. And I got into the kitchen. A few hours later, we were eating passatelli for dinner. Since, for me, there was nowhere really to go back to, I called mine “Going to Italy.” As with most simple dishes, the quality of the ingredients is paramount. I used some rich homemade chicken stock I had in the freezer, a couple fresh eggs from our coop and the best aged parmesan possible for the pasta. The result was richly satisfying, evoking traditions that, even though they weren’t mine, were deeply resonant. Perhaps one day I will try Bottura’s “Going Back”; but more likely not. There are simpler recipes in the book I would like to try — a spaghetti with anchovy pesto; a hazelnut-crusted foie gras “popsicle” on a stick. But more than the recipes, I am inspired to revisit my own tastes and memories, to take something old apart and put it back together new again. Which is really what art and cooking are all about. My pal Bob pointed out that there is an episode of the Netflix original series, “Chef’s Table,” profiling Bottura. I highly recommend you pour yourself a glass of wine and go watch. It’s an inspiring 45 minutes that may add a little Thelonious Monk to the way you think about food. Heat chicken stock in a large saucepan over medium heat to a slow simmer. Using a food mill or ricer (I used my handy, dandy spaetzle maker my Austrian friend gave me), extrude pasta into short noodles, directly into soup. Continue until all dough has been extruded into soup. Remove soup from heat and serve immediately. Okay everybody……I am the ever-generous sister, Andrea. I want to say that I do not choose these over the top cookbooks for my brother. I ask him to give me the names of 10 he is coveting for his birthday and then I buy him 2 or 3. I am a good cook but I do not even understand these cookbooks he loves. They scare the crap out of me. 10 years ago I came to his house and he had meat drying (was it drying, dude?) on his roof and something pickling for weeks on his counter. I may have had meat drying on the roof. And I’m quite sure there was likely something fermenting on the counter. I just can’t help myself. BTW, there was a third one that was on back order and if you never got that one, I got ripped off!!! They probably didn’t charge you for it. We just finished watching the Netflix series “Chef’s Table”. It was great, but I found there was such a haunting sadness in each of these chefs. 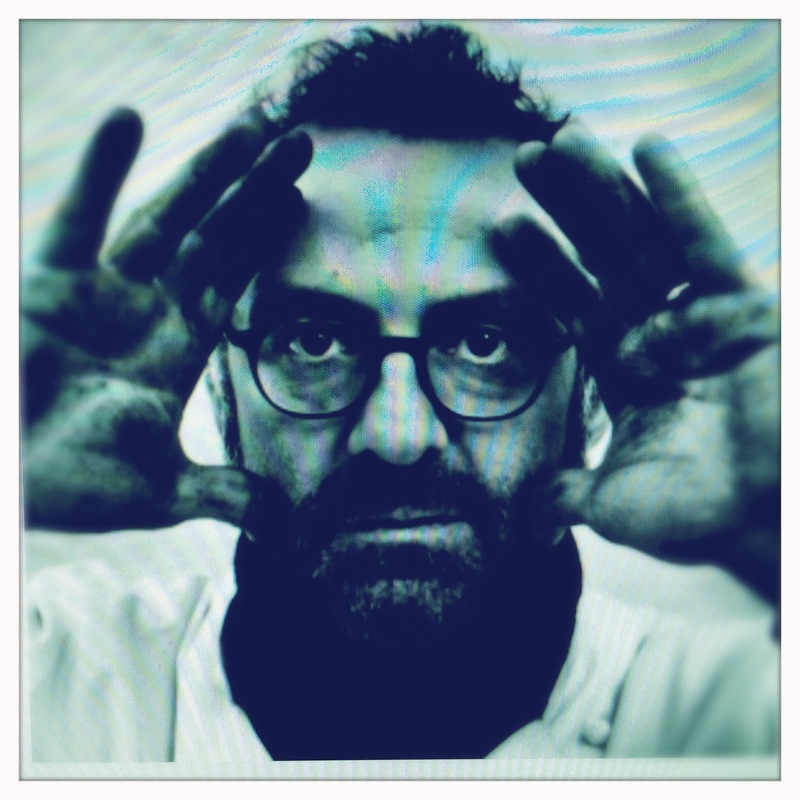 Massimo Bottura was perhaps the least so. They are a sad l0t. That’s why I’ll never be truly accepted. 😉 The Bottura episode is the only one I’ve seen, I want to try to eat there next summer. Happy Birthday talented Sean – best wishes for a deliciously adventuresome year. That was a beautifully written piece and I can’t wait to try the recipe. Thanks Ma! It’s a good one — enjoy it as part of a nice Italian dinner. Your rendition looks delightful — I need to try making those noodles sometime. Also I was telling my husband about this post and (of course) we happen to have the cookbook as well. Which means one of these days I will be making those foie gras popsicles! Hello stranger! 🙂 Usually w/ the gastrogod cookbooks (El Bulli, Noma, etc. ), I find inspiration for my own cooking in the innovative plating, color combinations, etc., and never bother trying any of the recipes. But I find that book more immediately accessible, and there are several recipes I want to actually make. There’s a new one coming out, Mexico City’s top chef + restaurant, I can hardly keep myself distracted and busy until drop date.